She was right – I do like Yarok Haircare (which means ‘green’ in Hebrew), a botanically-based line of restorative hair and scalp care, and I think Yarok’s founder and main-man, Mordechai, is pretty great, too. We met a few years ago on a photoshoot in Miami. He shared his products with some of the crew, and we all loved them immediately for their delicious scents and simple, yet eye catching packaging, but when he started sharing the story behind the line, telling us how dedicated he is to being all-natural in ways I hadn’t even thought of, as well as staying true to caring for the earth in every way he can (even his labels are 80% non GMO corn base, the most environmentally friendly non-paper material available that’s waterproof) – I was pretty wowed. 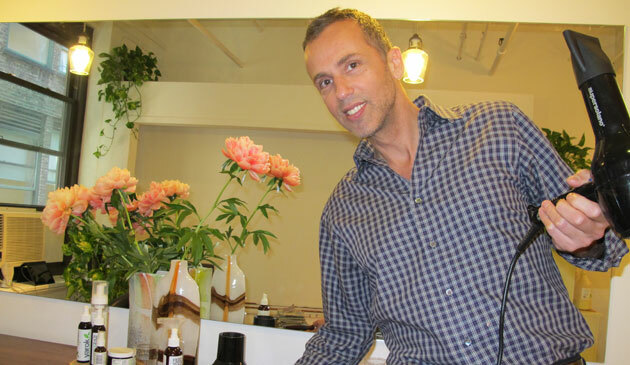 I went to visit Mordechai at Yarok Beauty Kitchen, his intimate 4-chair salon in Chelsea, NYC, for a little pampering and to find out about his line of products he creates on-site. The vibe was relaxed and fun, beautiful flowers in vases blossomed on top of the mid-century furniture with clean lines and sleek profiles, and a small staff of lovely ladies made sure I was tended to, taking my coat and bag and serving me my choice of delicious organic tea. Right away I noticed something was missing from the usual hair salon environment: the intense smell of synthetic fragrance and harsh chemicals! Conversation is easy and fun-loving with Mordechai, and it’s obvious from witnessing the interactions that took place on either side of me: he has a very loyal clientele. Together, we laughed, we teared up, we discussed love, life, and of course, non-toxic beauty products. 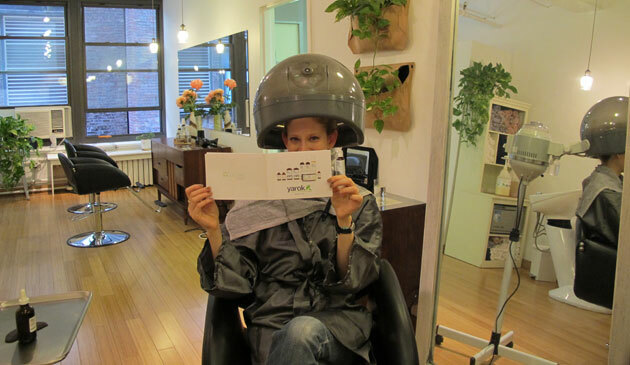 I even had some much needed down-time under the steam dryer with my eyes closed, enjoying the aromatherapeutic benefits of the scalp treatment he chose for me. I loved the scents of ylang ylang, orange blossom oil (which he told me helps with blood circulation and is known to calm and uplift the spirit), and bitter orange that swirled around my face during the 20+ minutes I sat letting the ‘Feed Your Youth’ serum work its’ magic. Admittedly, it’s become trendy to go ‘green’, but Mordechai was one of the pioneers on this path. When he first started in the fashion industry as an editorial and celebrity hair stylist, he was tormented with skin irritation from the highly abrasive chemicals in everything from shampoo and conditioner to gels, mousses, and hair sprays. It was out of necessity that he began tinkering with ingredients, testing his concoctions on willing clients and friends. His current line of hair and scalp care and styling products is made from powerful blends of organic and all-natural botanicals that he ensures are consciously sourced and responsibly harvested. Once my time under the steam dryer was up, Mordechai gave me a great blow-out and curled my hair ever so slightly, so that the wave looked polished, yet natural. I’ve had a hard time getting this kind of look elsewhere – it’s often a little too perfectly coiffed for my liking. We talked some more while he worked on me, and I have to say, this sweet man is incredibly well informed about the benefits of each and every ingredient he lovingly blends into his products. As I walked home, with new products in my purse, I reviewed all of the information he’d shared with me: it was as if I’d just sat through an hour long advanced class on antioxidants, botanicals, and essential oils! A great option as we enter the season of pools, salt water, sand, and harsh overhead sun: Yarok’s ‘Feed Your Sunshine’ hair serum protects and restores the hair and scalp from potential damage, and it smells deliciously summery with a blend of tea tree, geranium, and lemongrass oil. Go in for a treatment under the steam dryer, and pick up a bottle while you’re there to tuck into your beach bag and slather on before you head to the sand.